On this date in 1898, German chemist Dr. Felix Hoffman invented aspirin. On August 2, 1898, drinking and hooking up increased exponentially across Prussia. Dr H, please accept our deepest gratitude. As we roll further along into summer, grilling becomes an irresistible culinary option. However, for many urban dwellers without access to an outdoor grill, this can be a problem. Thank to Le Creuset, this problem can be alleviated. 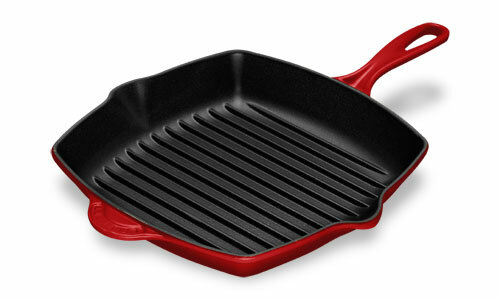 Their porcelain enameled cast iron grill pan should be a tool in any cook’s arsenal. The high ridges keep food from dripping away and results in low-fat cooking. This pan can get very hot which makes for excellent searing while the ridges produce those delectable grill marks that practically scream what I seem to do every Saturday night – devour me!